BusinessWire: ON Semi introduces its first CMOS sensors with NIR+ technology combining HDR with enhanced low light performance for high-end security and surveillance cameras. 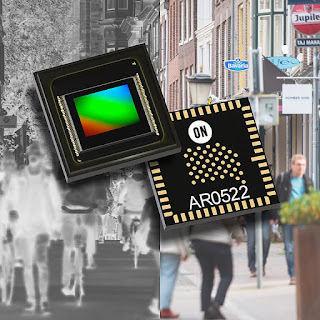 The AR0522 is a 1/2.5-inch 5.1MP sensor based on a 2.2 μm BSI pixel platform, developed for industrial applications that require high resolution, high quality video capture in low light conditions. The AR0522 image sensor delivers approximately twice the sensitivity in NIR over the existing AR0521. The AR0431 is a 1/3.2-inch 4 MP sensor based on a 2.0 μm BSI pixel technology platform. Offering low power modes and a frame rate of up to 120 fps, it is aimed to applications where slow motion video capture is required. Its low operating power fits for battery-powered security cameras, action/sports cameras, in-car DVRs and general surveillance cameras. ON Semi has developed NIR+ technology to increase NIR QE without sacrificing color fidelity in the visible spectrum. Through this technique, security cameras can use fewer IR LEDs on BOM driven at lower voltages and still achieve high quality images in low light and NIR conditions. The AR0522 engineering samples are available now, with mass production planned for May 2018. Engineering samples of the AR0431 will be available later in April 2018, with mass production starting in July 2018.